Editor’s note: This article is one of an occasional series profiling the 15 finalists for the Milwaukee Awards for Neighborhood Development Innovation (MANDIs). Safe & Sound is a finalist for the BMO Harris Cornerstone Award, which recognizes an organization for its commitment and effectiveness over time. When drivers sped through her block of North Buffum Street or tossed bottles and all manner of trash out their car windows, resident Josephine Key wanted to do something. “I would go outside and look at things that would go on in the neighborhood and I would think, ‘OK Josephine, are you going to get out and say something or do anything?’” said Key, who has lived there for almost 40 years. She and other longtime residents would shake their heads and say that something needed to be done. At that time, Key lacked the skills and confidence to stand up and take charge. That changed last year when she met Adrian Spencer, a community organizer working for Safe & Sound. Spencer encouraged Key to form a block club and work with her neighbors to tackle such problems. “Adrian has confidence in me and is always telling me, ‘you can do this,’” Key said. 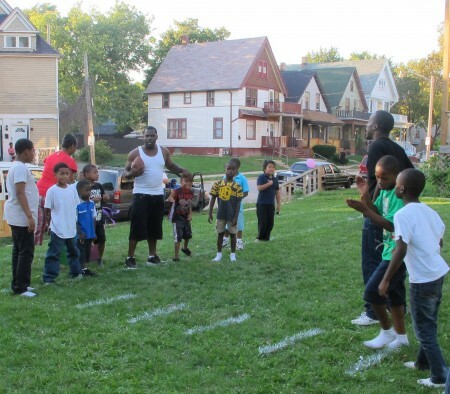 Helping city residents like Key work with neighbors to solve problems is an important part of Safe & Sound’s vision to achieve a safe neighborhood for everyone in Milwaukee. 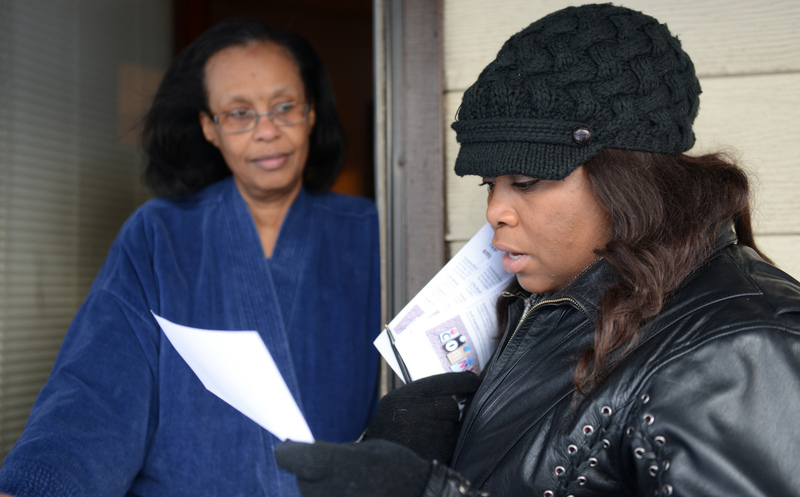 Spencer and other organizers knock on doors, develop relationships with residents and connect them with resources, directly and behind the scenes. The organization’s theory is that improvements in public safety require a combination of community organizing, youth development and law enforcement, according to Katie Sanders, Safe & Sound executive director. “We focus on encouraging residents to get to know each other, to develop a sense of familiarity with who lives and works on their blocks and what is normal. We also work to enable them to intervene when they see something unusual,” Sanders said. The dynamics of neighborhoods are complex, Sanders noted. Getting to the heart of residents’ concerns and supporting them in solving problems is critical to Safe & Sound. “The most important thing to me is ensuring that residents are a part of the solution,” Sanders added. One of the organization’s youth programs is Barbershop Mondays, which offers teen boys free haircuts and mentoring by volunteer barbers. Aaron Blather, owner of Rock Steady Barbershop, 1743 N. Dr. Martin Luther King Drive, has children of his own but relishes the role of father figure to poor youth struggling with a lack of guidance and support. Blather tries to help educate them, show them how to “turn the other cheek,” and find better role models. “Safe & Sound is about keeping them safe, raising them and giving them a chance,” he said. Safe & Sound works with law enforcement in city neighborhoods through a Community Prosecution Unit model that brings staff members together with representatives from the District Attorney of Milwaukee County, Milwaukee Police Department, community-based organizations, Office of the City Attorney, Department of Neighborhood Services, Wisconsin Department of Corrections and Sojourner Family Peace Center. “At the heart of that partnership is a civilian coordinator from Safe & Sound who represents the interests of residents,” Sanders explained. “There’s a lot that Safe & Sound can do that we can’t do without them, said MPD Assistant Chief James Harpole of the Neighborhood Policing Bureau. Capt. Jutiki Jackson, a member of the police department’s 7th District Community Prosecution Unit (CPU), explained how an Adopt-a-Block initiative carried out last year helped him and his colleagues build bridges to residents in an area around the 4400 block of West Center Street. MPD selected the neighborhood because it had both a substantial crime rate and residents who “wanted to take an active role in helping us reduce the violence,” Jackson said. A survey designed by Safe & Sound revealed that residents’ top concerns are safety and employment. Enlisting the help of Pastor Dan Czaplewski and his congregation at Mount Calvary Lutheran Church, 2862 N. 53rd St., the CPU brought employers to a job fair, helped residents clean and shovel their yards, hosted a summer block party and provided needy residents with Thanksgiving dinners. Through these interactions, the police were able to talk with residents in informal, friendly settings, which resulted in increased communication and trust between residents and law enforcement representatives, Jackson said. He particularly appreciated the opportunity to play basketball with area youth and talk with them about caring for their neighborhood and opposing bullying, he said. Another result was the formation of several block watch clubs. “Whenever we can create a block watch in a neighborhood, that’s one great step toward building community relations, and strengthening the neighborhood, and that all goes toward reducing crime,” Jackson said. Czaplewski said he’s observed an effort by the 7th District CPU and some neighborhood residents to establish the kind of rapport that will make everyone safer. Founded in 1998, Safe & Sound grew out of a task force that brought government, institutional and business leaders together to address an increase in violent crime. The organization still uses essentially the same strategy the task force developed, but conditions have changed since then and Safe & Sound has continually reinvented itself to address those changes, Sanders said. Safe & Sound is affiliated with the federal High Intensity Drug Trafficking Area (HIDTA) initiative and is home to the 27th Street West Drug Free Coalition, a community coalition working to prevent alcohol and marijuana use among teens on Milwaukee’s west side. Josephine Key credits Safe & Sound’s Adrian Spencer and the Buffum Street block club with enabling her to find her voice, speak to her neighbors and encourage them to stand together to make their neighborhood safer, more attractive and a place to be proud of.